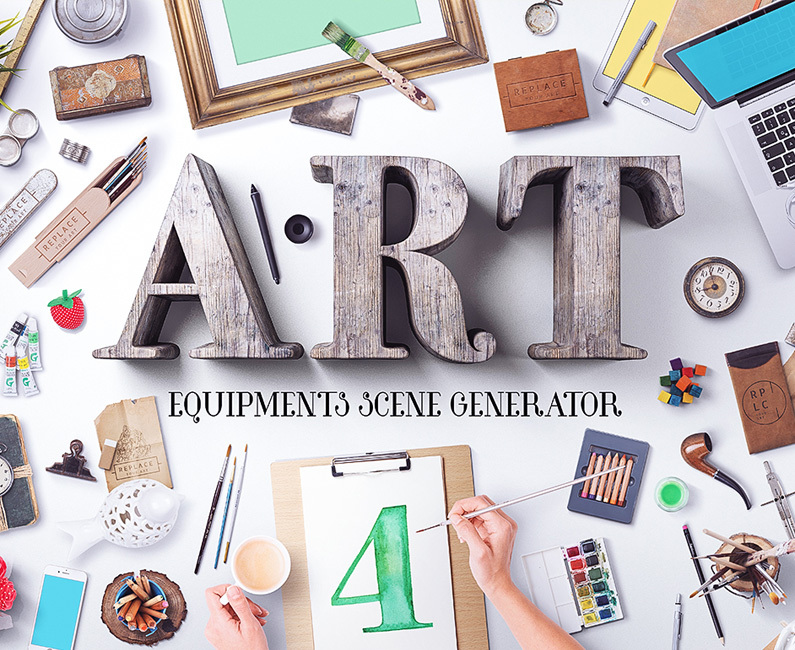 This Art Equipment Scene Generator toolkit is perfect for the busy artist looking to show off their project. Present your work in a professional and visually-stunning way with this awesome presentation pack. This scene generator includes: Old boxes, brushes, pens, papers, sketchbooks etc. Paste your designs directly into the scenes or add your special signature to the old box or notebook covers. You can also add a watercolor effect to your designs using the “Watercolor Generator”. This tool allows you to get a realistic watercolor effect by just pasting into the smart object. You can also now do this with “Hand Sketched”, an additional effect in this pack. This file includes over 100 items, all of them grouped and layered, so you can drag & drop any items into the Scene Generator and move & rotate them as you wish. This Scene Generator includes 15 high resolution ground textures. You can place your items on to any textured ground. In addition, you will get 20 frame mockups to put your artworks in. Software requirements: Adobe Photoshop CS4 and newer. File size is approx 2GB (3.64GB unzipped), offered as a single download, as well as a 2 part download. And I bought the item 2015 and like to know more if there is an update for this. I cant find a notification to an update in my account from the item. I like the wishes from summer.solistice.girl & Vicky Robinson for more mixed media items like ink pods, finer brushes, paints. I have also popped you over an email to help give you more information about the sizes of these frames and product updates! so, there is no update for previous buyers? Thank you so much for replying to my comment. Unfortunately providing updates is at the discretion of the designer but the majority of the time, they will provide us with free updates if their update is within 6 months of their initial release. As you picked this one up in our Gorgeous, Artistic Design Bundle back in 2015, we are unable to provide you with a free update so my sincerest apologies for any disappointment caused Morgaine. This is very attractive and would do most of what I need. It’s missing unframed art canvas images, which is (frustratingly) common, as well as smaller frame sizes. I do a lot of small art: 8×10 down to 2.5×3 and there’s never anything for those sizes. However, I’m still really interested in this for my larger pieces, but you don’t actually state the resolution the images are in. Do you know what the actual resolution numbers are? I have also popped you an email to give you more information on the sizes for these frames to help you further with this! Thank you so much for commenting! These frames are all provided in high resolution but I am so sorry that the sizes were not included on the product page for you. I have the same question as others. I purchased the bundle in which this was previously included – do I need to purchase it again or is there an upgrade fee? Can you list what’s new or different from the older version – besides the women’s arms – so I can decide if I there’s enough for me to consider purchasing it again? As a mixed media artist, I too am constantly look for mockups and I think this is the best and most comprehensive art-related product out there. However, If the developer would expand to other kinds of art media and tools (craft paints; tubes of acrylic; palette knives; paper cutters; letter blocks such as those shown in the ad but (disappointingly) not included in the product; more feminine looking journals; random bits of vintage papers and fabric; stencils; markers; inks; etc. ), he/she would have the corner on a market that is completely under served right now. I tried photographing these kinds of things myself to add them to the mockups, but because of the lighting they looked odd. I will definitely pass your feedback onto the designer as well though as i’m sure they’d love to hear this and see what they can do! I’ve popped you over an email too so that we can go through this in more detail! I was also really tempted to get this, but I really have to be tough on myself – I’m a book designer and I have to limit myself to mock-ups that show books. What you be amazing would be something like this with different book sizes, cover templates, i.e. Crown Quarto etc. That would be awesome! Thank you so much for getting in touch with your feedback, we really appreciate you taking the time 🙂 This is awesome and I will certainly pass your suggestion onto the designers to see if this could be available in a future update! Totally love this Art equipment set. I use these items and more in my work. Fantastic that you added the female arms, only thing is i’d love an addition of arms for a woman of colour. Thank you so much for your kind words. It is fantastic to hear that the Art Equipment Scene Generator has made a really useful addition to you creative toolkit! 🙂 I hope you enjoy working with it and all of your other purchased items! Thank you again for your support, Grace. It really means the world to us! If there is ever anything I could assist you with please do get in touch. I’m always happy to help! Thank you so much for getting in touch with your shopping list! Rest assured, we don’t mind at all 🙂 It’s great to have an idea of what sort of items you are looking to work with. Thanks again, for your feedback, Audrey! If you have any questions or if there is ever anything I could assist you with please do get in touch. I’m always happy to help! I want to say how much I love this site and all of the designs! I am looking to purchasing a mock up, but I am particularly looking for a more feminine-type theme. Will you be getting any new mock ups soon? Unfortunately we don’t currently have any feminine-type mockups available in our marketplace, but rest assured, I will certainly make sure that we keep a sharp eye out for some awesome resources for you to include in the near future! If there are any particular items on your wishlist, please do let me know and I will do my best to source them for you! Thanks again for getting in touch, Daisy. If there is ever anything I could assist you with please do get in touch. I’m always happy to help! If you have any other queries, please do let me know! I’m here to help! I love that the Women’s arms were added!! I need just the arms to go with https://www.designcuts.com/product/gorgeous-artistic-design-bundle/ I commented over there too, but just wanted to see if you saw here easier. I had bought that bundle when it came out. I hope it helps, and please don’t hesitate to contact me should you have any other questions. I’m here to help. I also bought this a long time ago and I’m needing that woman’s arm (ha!). Is the update available for those of us who purchased a while ago or maybe an additional fee applies? Thank you so much for your comment! I can certainly help you out with your query and have just sent you a quick email to assist you further. I hope it helps, Katerina, and please don’t hesitate to contact me should you have any other questions. I’m always happy to help! Is it okay to say, “Me too!” I’m a woman and was bummed the previous bundle I bought only had a man’s arms. Thanks in advance. We can definitely ask the designer if we’re able to add version 4 to the bundle that this one was original featured in! I hope this helps, and please don’t hesitate to contact me should you have any more suggestions for future resources, I’m always here to help! Thanks again for your feedback, Claudia! This would be perfect for mockups on my new downloadable printables. How realistic do the “create your own scenes” look? I haven’t used anything like this before so I’m just wondering about shadows etc. Thanks for getting in touch, we have received some awesome feedback from our community about the realistic look of these items so hopefully they should work great for you in your projects! However, if you do have questions about this item or if there is ever anything I could assist you with please do get in touch. I’m always happy to help! Thanks so much for the comment and for the feedback. Mockups are an awesome obsession to have and you are in good company :).I am so sorry that this one isn’t suitable for your projects. Rest assured, I have noted your suggestions and we will start looking for mockups with a wider variety of backgrounds! If you come across any that you would like us to try feature, please do send me over the links and we can work on sourcing them for you!